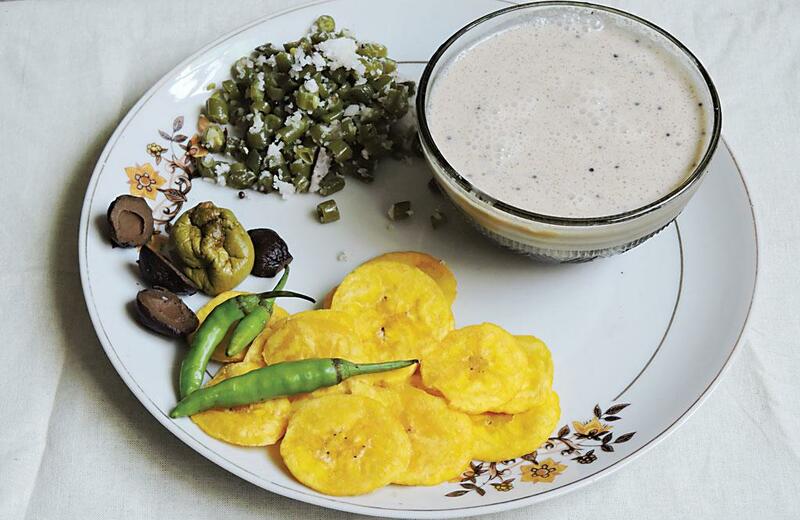 Can indigenous varieties of baby mangoes produce an entire range of much-sought-after pickles? The answer is a big yes, if one goes by the quantities of spicy pickles known as vadu manga or mavadu or kadugu manga consumed in south India, mainly in Kerala, Tamil Nadu and Karnataka. The non-spicy version made using the same mangoes and common salt is the kanni manga, which holds a special place as it is prepared only in homes, while the spicy version is made in homes and is also marketed in bottles by leading brands. I was reintroduced to this delicacy when we discovered a bottle of some old kanni manga while cleaning the kitchen after losing my mother. The fact that the mangoes had remained pickled for several years aroused my curiosity. What makes these pickles special? The best part of this pickling process is that the mango is pickled whole along with the stem. The stem is not discarded, so this preserves the whole mango. The key element is the correct moment to pick—when the baby mangoes are an inch or slightly more in length. A slight delay and the mangoes will grow in size and cannot be used for pickling. The baby mango crop is available for a mere 15 days in a year. They are the first crop of mangoes and they are pickled without the addition of any oil or preservatives. And they last for a few years, without a change in their taste. Most of the mangoes used for pickling are indigenous wild varieties that grow in the forests and are collected by the local populace. The picking of the mango is done using a long bamboo stick with split ends, and the picker uses the stick to direct the mangoes to his basket. So what varieties are used for pickling? The mangoes grow along the Western Ghats. In each state, these baby mangoes are known by a different name and have a different flavour, drawing from the soil and climatic conditions of that area. In Kerala, it is known as natu manga or nadan manga. Other varieties include moovadan and chandrakaaran. 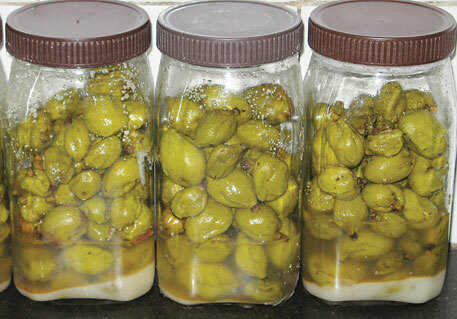 The latter is the most expensive one and considered best for pickling. The buying of these mangoes is largely a women-centric activity. My father recalls how his mother would bargain with the seller. The vendors would turn up every year with their basket full of mangoes. It is a ritual which is still followed by my aunt, who revels in making the spicier version. Of late, though, she has not been getting her quota as the vendors sell it to cottage pickle-making units. The best mangoes are those that are specially picked for this purpose. These mangoes used to be sold in measuring glasses called the “nazhi”. Today, they are sold by the kilo and cost between Rs 100 and Rs 150 per kg. These preserved mangoes can be consumed as a blissful accompaniment to curd rice and are actually light on the stomach. These mangoes are difficult to get in Delhi, but the owner of Sree Rama Stores, Munirka, New Delhi, religiously procures rationed quantities for patrons every year from Palakkad, Kerala, on advance booking. The season for the mangoes begins February-end and finishes by the first week of April. With a lot of planning I bought myself a kg of the small baby mangoes. It was then that I realised I did not know how to pickle them and a benevolent aunt came to my rescue. The mangoes are sticky and attached to the twigs of the tree. They have to be cut with their stem intact. One should smear hands with oil to prevent any sap from touching the skin as it can cause boils. The mangoes are washed well and spread on a cotton cloth, usually overnight, to dry. In the morning, pat dry each of the mangoes separately. Clean and dry a couple of glass bottles to hold the mangoes. Take care to ensure that both the mangoes and the bottle are dry since the mangoes are prone to fungus even if there is a trace of water. Now, take common salt in the ratio of six glasses of mangoes to roughly 3/4th glass of salt. One can use sendhanamak of the north or indhuppu from south. Put a fistful of salt at the bottom of the jar. Cover it with a layer or two of mangoes. Then put some salt and then mangoes. Keep repeating this till the jar is full. Tightly seal the jar. Shake the jar every day to ensure that the salt dissolves and soon the mango will give off its juice. Let the jar sit for a month or so in a cool place. The mangoes soon start shrinking. When it is really shrunk, the kanni manga is ready to eat. While eating, the stem is carefully cut, otherwise the sap or resin secreted by it can cause boils or reaction on the skin. The baby seed within is discarded. One of the popular dishes is the manga arachukalaki (see ‘Recipe’). It is eaten with plain rice to the accompaniment of banana chips or papads. This is a simple dish made with easily available ingredients. Arachu means ground or blended and kalaki means mixed. The dish is made by grinding and mixing the ingredients and does not require any cooking. For a modern twist to this traditional recipe, use hung curd instead of watery curd. Blend everything together to form a nice, thick paste. Do not give the traditional tadka. This works well as a dip. Wash the mangoes well, cut off their ends and slit them lengthwise. Remove the seed. Finely blend the grated coconut with the green chilies and the mangoes. Add the curd and give the whole mixture another whip in the blender. Pour into another container. Splutter the mustard seeds in a tablespoon of oil and season the mix. The consistency of the arachukalaki should be akin to sambar or dal. It is usually eaten with rice, instead of the usual sambar or dal. It is best eaten with banana chips or fried pappadam or appalam.